The 6th Moscow Biennale was not your average biennale concocted with the classic ingredients copied worldwide without questioning. Not only did it run for just ten days, it also felt more like a meeting place than a static biennale presenting existing – or some commissioned – works. With talk shows, debates and lectures by people like Yanis Varoufakis, sociologist Pascal Gielen and futurologist Maya van Leemput, it was a social-artistic laboratory that created quite a buzz. We met up with the curator, M HKA director Bart De Baere – who invited Nicolaus Schafhausen and Defne Ayas as co-curators – to find out more about the biennale’s genesis and the many challenges leading up to it. Your first concept for the biennale differed from the final one and was meant to take place in the Manege. What happened? Bart De Baere: Yes, there are a lot of organizational anecdotes that could be told. When I was asked to do the biennale, the situation was quite different from two years ago, when Catherine de Zegher was the curator. She is one of Flanders’ most important international figures. She has a very impressive track record and, among other things, she also curated the previous edition of the Biennale of Sydney. When I was invited, the question was already different. The biennale was a bit in trouble. To be clear, that has essentially nothing to do with Catherine’s edition. She made a relevant biennale and gave a lot of space to female artists, which certainly made sense in a masculine city like Moscow. But in the meantime, the climate had changed and certain things that used to be self-evident were questioned, omitted or diminished. There was a conservative minister of culture and the patriarch had also made some critical comments on contemporary art in public. There were doubts as to whether the biennale could go ahead. The main reason why I accepted is because I find the biennale a key element for the connection of Russia and Moscow with the art world in general and with Western Europe specifically. We will have an interesting future if we find a way to connect Moscow with the West. It is part of our heritage. The avant-garde happened both in the East and the West. Is that something we too often forget in the West? – Yes, or we disregard it. As if the avant-garde came from another country, a country that is nowadays seen as a bogeyman. We don’t realize that it is an important element of Europe. It is frightening that we can hardly form an image of Moscow or Russia, or of Ukraine or Georgia. These are abstract concepts one can play around with on a geopolitical level. Moscow has a substantial art scene with major state-funded institutions and some very important foundations that I consider among the best in the world. For such a scene with an international capacity, a biennale is essential. We therefore found it crucial to continue. Stopping would be a huge loss for the future. That is why I wanted to make an offer they could not refuse. I initially proposed the notion of ‘a progressive Eurasia’. For us, Eurasia is something abstract. Joseph Beuys saw it as the union between Europe and Asia. But in Russia, it has an entirely different meaning. There, it means everything except Western Europe and Asia proper. So essentially Russia and its former satellite states? – Yes, more or less like the Russian Empire. It is part of Vladimir Putin’s conservative identity politics, though not the main part. He is supported in this by far-right forces, which I find awful. It is a kind of hijacking of the original concept of Eurasia that was formulated in the 1920s by people like Nikolai Trubetzkoy and Roman Jakobson. They were thinking about a possible alternative for Russia, different from the old empire. It was a kind of utopian thinking. So my idea was to offer different voices a platform to undermine the takeover of that term by the far right. And to listen to how artists in Russia see this potential, as compared to people in, say, Antwerp. So you basically selected artists from Eurasia? – The venue was to be the Manege, where the previous edition of the biennale had taken place. It has two huge floors of 4,000 m2, of which the lower one is air-conditioned. My proposal was to show an ideal collection of art from the late twentieth century on the lower floor – but from the point of view of Moscow and not from the traditional art historical affiliations as told by New York. I wanted to connect international artists with Russian artists: for example, Warhol and Bulatov, or Jef Geys and Kabakov. Was it an attempt to rewrite the traditional Western canon? – It was to be about, ‘How can you think about art?’ ‘How can art make sense?’ ‘And how can you make a canon for the future?’ Andrei Monastyrski would be on a par with Gerhard Richter, Sigmar Polke or Louise Bourgeois. The financing for that project was completely covered. But the biennale is run by the state? 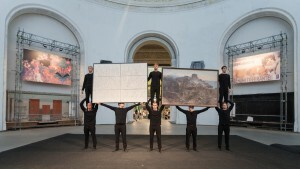 – The biennale is an initiative of the Russian State. But since the last edition, the budget has been halved. Normally the City of Moscow also contributes, but they pulled out. However, I found over a million euro from private sponsors for that most expensive part of the biennale. Initially I told the organizers that I would not do the biennale for less than 2 million. In the end, I signed on for 1.5 million. The idea for the upper floor was to show positions of individual artists as different worlds within Eurasia – which I see as the biggest island in the world: work from an artist from Ghent next to that of an artist from Shanghai, and so on. The proposal was ready. But then I heard in November 2014 that the venue was no longer available. The venue that had previously been agreed on? Was it not possible to do the same show in another venue? – No, that would have been absurd. The Manege is really in the heart of the city, next to the Kremlin. I do not want to go into details about why we lost the space. But once it was no longer available, we decided to go to VDNKh, my favourite place in Moscow. It is a bit like the Giardini in Venice, but bigger, with over 70 pavilions. And it has great symbolic weight. There is also plenty of activity there, from old grandmothers selling clothes to rock bands playing concerts. You can feel the former grandeur of Moscow. Until two years ago, it was a kind of open-air market. Those beautiful pavilions were divided in two levels to offer space for little shops. When I was there a while ago, I saw they were restoring it and I thought to myself, ‘It would be great to do the next biennale there’. Not knowing that it would already be my edition (laughs). For my initial idea, I wanted to be in the centre, at the heart of power. Because of this move, however, we were a bit in the margin. You become more harmless by going outside the centre. I hesitated. But I knew from the beginning it was going to be tough. I also saw the potential. It did not make sense to go on with the initial project because of the location. And the climatic conditions on site were not good enough for some of the expensive works I had in mind anyhow. The venue had a capacity, but not the one of the original proposal. I thought, ‘What if we go for the complete opposite? Instead of making this overwhelming exhibition, what if I invite some colleagues that are extremely professional but also good at improvising and we each curate one pavilion?’ A completely decentralized way of working and a way to activate VDNKh’s potential like the Giardini. We invited Nicolaus Schafhausen and Defne Ayas. When we arrived there, I immediately understood that we could not carry out that idea either. We heard that once the pavilions were restored, they fell under the authority of the Russian Federal Monument Care. We were not allowed to touch the walls at all. That would have meant that we had to build spaces within the space, rather absurd in such Piranesi-like venues. We also realized that even financially we could not go for three pavilions. But we did not want to give up and so we radicalized the project. We went for a single pavilion but a symbolic one. We wanted the Ukrainian pavilion which is pretty much in the centre. The director, a former politician, said that it was impossible because of its bad state, but in the end they offered us the Central Pavilion, Pavilion no.1. In the meantime, we were not only running out of time, but also out of money because the sponsoring was gone and the rouble was devaluating drastically. – Yes. As a human being, you are always free to stop. You have to ask yourself if it still makes sense. If you hit a wall, you can stop, go around it or jump over it. We decided to jump over it. So you decided to go on despite being underfinanced? – I don’t want to use that as a principle, however. I don’t think it is correct to underfinance museums. But as a one-off strategy, the financial aspect can be a way of replacing some fixed formats by a ‘back to basics’ attitude. We went for a more radical approach. And that is what we did systematically all along. For example, we decided not to publish a catalogue for the biennale, as that is often merely a bit of a hassle. So we kept an eye on our budget that had been diminished by 50% by then. So what else can we get rid of? Cutting the catalogue was a gain. We had to make budget cuts in the communication. That was a loss. – Moscow is a city of 15 million inhabitants. If you want to put your event on the map, you have to communicate. So we needed that. Ideally, we should have gone for a larger campaign than we did. Transport is the biggest part of the budget. The key moment is when we decided to scrap that out of the budget as well. At the end of the day, it’s about people. That is something we seem to have forgotten. Nowadays it is more about which work by which gallery we will transport in a crate by aeroplane. I put it a bit polemically of course, but we are heading in that direction. So we wondered, ‘What can a person do on a specific moment to create an added value?’ ‘What can you expect if you only invite artists?’ Of course, performances, lectures and talks. We also went for making work on site. Vaast Colson made a performance every day. Honoré d’0 was basically constantly performing. And every day we showed the video oeuvre of an artist – not just one video but all of them. Luc Tuymans made an amazing mural. Els Dietvorst created a huge sculpture of a skull. It took her ten days to finish it with the help of a group of people. Did you decide to reduce the biennale to ten days in order to keep its intensity? – Yes, that was a result of it. I find the loss of contact between the East and the West of Europe frightening. The impossibility of talking and of finding a common solution between both parties is scary. We clearly wanted to work around that question. So the idea was not to make an exhibition about how to meet, but to try to achieve that in the venue as well. It helped to solve the question of a shrinking budget and to make the shortest biennale ever in order to keep that intensity. So all these things added up spontaneously. It was not an abstract recipe. It was a specific response to a specific moment. Certain things happened that way so you have to have the guts to follow. With every adversity, we kept on cancelling things. Openings are also very expensive. People in Moscow don’t ask, ‘When is the exhibition?’ They ask, ‘When is the opening?’ We did not have an opening – another 20,000 euro saved. The website was another issue. As we have software in M HKA we use for Ensembles (a digital tool for research, ed. ), we decided that we would take care of the biennale’s archive. So we constantly found atypical solutions. – It might sound naive, but the idea was, ‘How can you make a space where art can enable you to learn something about the biennale’s main question?’ It is not a festival, but we wanted to leave the classic formats behind. It was about the moment an artwork appears in the world. Like Tuymans’ mural that had a different intensity than a painting that is brought over, regardless of how good it might be. It is like being in an artist’s studio and feeling what the artwork – that is not there yet – will look like. The biennale was ephemeral with a lot of performances, talks, etc. Was that also a way of avoiding the increasing notion of art as a commodity? – Indeed. It was about leaving behind certain automatic reactions like an artwork is a work for the art market. Don’t get me wrong. I think it’s positive that there is an art market. However, I do have a problem when it is perceived as the only option. That I find dramatic. And then there was another question, ‘How can art make us put certain things into question?’ ‘How can we be attentive?’ So we also organized an entire media machine. There were video teams, professional photographers, a couple of bloggers that wrote texts on the spot for the website. It was not only about documenting, however. Documenting is not the same as watching. So there was the effort to understand the biennale’s main question by reflecting on art. That is why we invited not only artists but also keynote speakers. And people like Thomas F. McDonough and futurologist Maya Van Leemput. There were also a lot of things happening behind the scenes. Some works were only finished on the last day. So the show was ready on the finissage, on the last day? – Yes, indeed. If you give up certain norms of standardized visibility, you find yourself in a special situation. But you can also gain a lot from it. You see things happening. A lot of visitors and artists enjoyed the contact that happened between them. But it was spontaneous and not forced. It was more about the possibility of having contact, like in a free zone. It was a very short, intangible biennale. How are you going to document it for the future? – The Singaporean documentary maker Ho Tzu Nyen made a documentary and so did Almagul Menlibayeva. Ten days before the opening, we had another financial blow so we had to do away with even more. If you have binned so much already, it becomes difficult. I found it important to finish without a deficit, however. Otherwise you leave your successor with a problem and it is often the weakest people in the chain that will fail to get paid. Sometimes it is the artists who do not get fully paid or volunteers who were promised a tiny fee. I made it a point of honour to finish with a break-even. We therefore had to make a hard decision to reduce the documentary exhibition about the biennale from one month to ten days. It was a very nice show by the way. It happened in the same place as the biennale. You could see all the works that were made there. There were screens with the edited videos of the performances on the same spot where these originally happened. We made the documentary exhibition shorter since there were not many other things we could still get rid of. So the venue, material and people became less expensive. Whereas now the only question asked afterwards is how many visitors there were? – Exactly. While we did manage to make a difference for Moscow and for the art world, there are two options now: either it was the last biennale, or after this edition there is going to be a big one again. We managed to do something that got picked up as far as New York. On the last day there was a phone call from Massimiliano Gioni, ‘What is going on there in Moscow? Should I fly over?’ Too late! It is nice to hear that a ten-day event can create a buzz that reaches New York. That is quite exceptional. I think it happened because it was a response to a question. People are fed up with biennales that are more and more like art fairs. They are unsatisfied with that. This was a kind of ‘back to basics’. And don’t forget that Moscow is an artist-driven art scene. People saw it as a proposal about what a biennale should be, with other capacities than a mere group show, with the capacity to generate reflection and not just to present artworks. Several people were saying that this was a model for future biennales. I am not so sure about that. It was a specific moment, a strong moment that worked well. I am not sure you will get the same intensity if you repeat it. You also mentioned that it was a return to something we had lost on the way. What do you mean by that? Is it a return to the essence after the so-called professionalization of the art world and everything surrounding it? – Don’t get me wrong, I am not against professionalism. I think the art world should be ten times more professional than now, as it is sometimes quite a mediocre mess! What I can’t stand is that people use professionalism to be lazy. – Yes, but the danger is that, if you constantly work without money, the government might wrongly assume that you don’t need a budget in the first place. It is also the kind of thing you can do once, but not keep on repeating. – Indeed, I wouldn’t have done it in any other place in the world. Normally, the three of us would have said, ‘What you offer is not enough. We won’t do it’. But then this biennale would probably not have happened. How do you act as a curator in a contested area like Russia? On one hand, you are a guest. But on the other hand, there are some serious issues to be addressed. So how do you avoid engaging in a frontal attack and offending your host, while not ignoring important issues either? – That comes back to the question of the boycott. I respect all decisions that are seriously thought through. But with a boycott, you have to ask yourself, ‘Who am I boycotting?’ I find the question as to why we accepted this biennale, organized by the Russian state, a relevant one. But questions about the boycott don’t distinguish between a regime, the government and the people. And these are three different things! To be honest, I find almost everything problematic, even doing a show in Brazil where so many people get killed by the police. I also find it hypocritical how the media play a kind of game by picking up certain things while ignoring others. Besides that, there is also the question of timing. This is also strongly connected to a specific situation. If they were to offer us this in two years, we might say no. But this is a crucial moment for the future of Europe and Moscow. I went to the Belgian ministry of foreign affairs to hear what their official policy was. Our minister of foreign affairs, Didier Reynders, follows the policy of Angela Merkel in this respect. They want to be clear but also to keep communicating. And I agree. I think that this is cleverer from a geopolitical point of view than what the art world does with its rash condemnations. As long as there is a conversation going on, every difference matters, even if it is only a tenth of a percentage. Because the stakes for the future are so high!